Our property abuts 2 streets. The front of the house (mailing address) is at 25875 Estacada Way, Los Altos Hills, CA 94022, but the coop will be more accessible from Saltamontes Way which abuts the back of the property. Our neighbors across the street on Saltamontes Way will also be on the tour. This will be a newly built coop, with a 3’x6′ raised hen house and a screened-in 6’x15′ run. We should have around 6 young chickens by tour time. Unique features of the coop might be the relatively easy construction, and pull-out, drawer-style floor sections for easy cleaning. 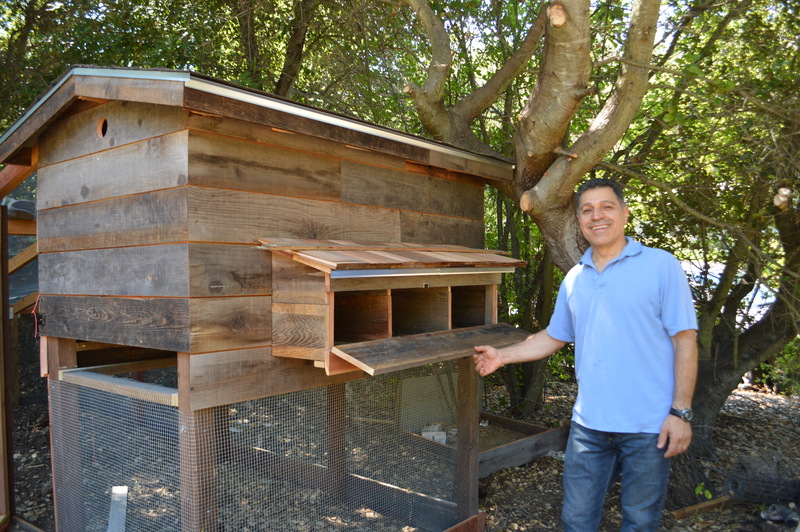 Most of the materials were salvaged from an old redwood fence, but the coop looks really nice, if I say so myself! !